But I have no camera to take a before picture. It doesn’t matter, I’m very neat so few people would see the difference between the before and after anyway. It’s going to take three days and on Wednesday I’m getting a new haircut and color as a reward to myself. This time I’m going short! I’ll use the computer’s camera to get a picture. I went to a book reading last night. The author was Harold Goldberg, the first person to review my first book! A kindness I will never forget. 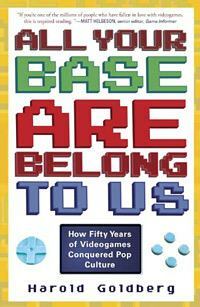 The book is: All Your Base Are Belong to Us: How Fifty Years of Videogames Conquered Pop Culture. The bad grammar is from a computer games in-joke. I didn’t know these games have been around for fifty years. The earliest one I remember is Pong. From what he read it seems fascinating. I know there’s this whole world of gamers and creators, but I know nothing about it and it looks like it’s all in here. I also need to tell the story of my recent Jeans Shopping Trauma. Why is it so hard to find a decent pair of jeans?? But I think I found them, in the most unlikely style (for me).